Party Poker used to be the largest online poker room in the world, but lost some market share after they left the USA market. Party Poker features fishy competition, a 100% up to $500 bonus, and a sparkling reputation. Party Poker (www.PartyPoker.com) is one of the largest online poker rooms in the business, averaging nearly 40,000 players online at peak hours. Soft competition and an exceptional tournament line-up have a lot to do with the big traffic numbers. Party Poker is also known for its intense tournament schedule, including a $300K Guaranteed every Sunday and the famous PartyPoker Million. The software at Party Poker is privately developed, and is the only part of the online poker room that doesn't really stand out too much. The graphics are good, but not exceptional; the lobby offers most essential stats, but no viewed-flop percentage; most of the standard features are there, but nothing special to write home about. The only notably inspiring feature of Party Poker's software client is its multi-lingual capabilities, offering play in 11 languages: Czech, Danish, English, Finnish, French, German, Polish, Portuguese, Russian, Spanish and Swedish. Party Poker offers a downloadable poker client, compatible with Windows PC, as well as an instant play Flash version that is compatible across all operating systems (PC, Mac, and Linux). The instant play version made our list of the best no download poker rooms. The interface is user-friendly and easy to navigate. Graphically, Party Poker offers decent avatars, but without much movement, they just seem to get in the way for serious players, taking up more room than necessary. On the plus side, the cards are much larger than life, and are very easy to see. 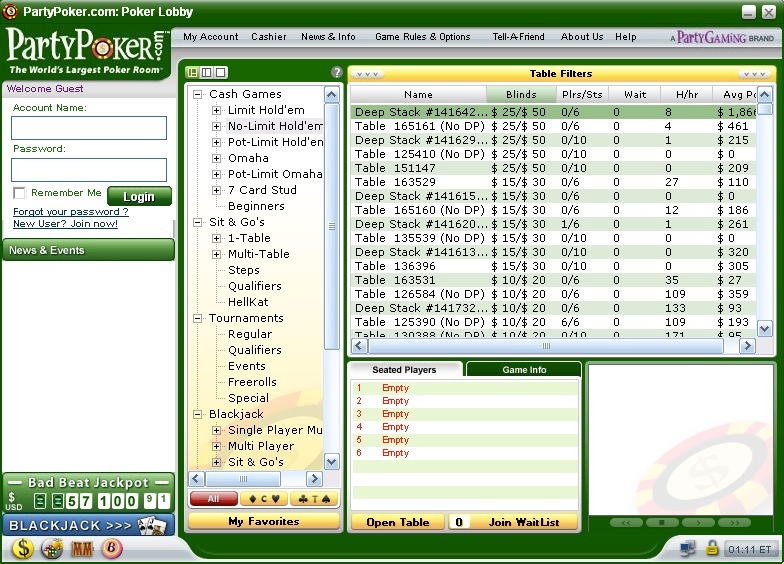 Party Poker is well suited for multi-tabling, featuring a maximum of 12 simultaneous tables that run very smooth. The poker client has a very good alert system, using both graphics and audio to signal a player's turn. An auto-resize function can be very handy depending on how many tables you have open and the strength of your eye-sight. This feature automatically resizes all tables to fit evenly across your screen. Learn how to download Party Poker. Also, if you happen to be on Linux, Party Poker is one of our favorite Linux Poker Sites. Party Poker offers promotions including their $500 sign up bonus and their $1,500 New Depositor Freeroll. Party Poker offers a 100% up to $500 bonus to all new depositors at the site. To redeem the bonus, sign up at PartyPoker.com and use bonus code 500PS. After you make your first deposit, your deposit money will show up in the Cashier, and an equal amount will show up as Bonus money (due to the 100% match). You then have to "clear" the bonus money before you can play with or withdraw it. To clear the bonus, you have to earn 5 Player Points for every $1 of bonus money. The bonus is released in five chunks, so if you deposit $500, you will receive $100 every time you earn 500 Player Points. Players have 90 days to clear the bonus money - after that, any remaining bonus money expires. You can learn more about earning Player Points by reading our Party Poker bonus code page (click the blue link above). Every Saturday, Party Poker runs a $1,500 freeroll that is only open to players who have deposited within the last sixty days. New depositors can play in as many $1,500 freerolls as they want (until the sixty days have passed). That means you have up to eight shots at the $1,500 prize pool (for free!). Party Poker offers the standard game variety of Texas Hold'em, Omaha, Omaha Hi-Lo, Seven Card Stud, and Seven Card Stud Hi-Lo, with Fixed Limit, No Limit and Pot Limit stakes available. Choose from heads-up, short-handed, and full tables. The stakes start at Micro-Limits of $0.02/$0.04 in No Limit and Pot Limit, and $0.05/$0.10 in Fixed Limit. The highest stakes are $250/$500 Fixed Limit games. Party Poker also presents a versatile selection of Blackjack games, including Single-Player Blackjack and Multi-Player Blackjack, both offering single-hand and multi-hand versions of the game. One cool feature is the fact that Party offers Beginner tables for new players, that only new depositors can sit down at. This way you can warm up playing against new players, then try your luck at the normal tables. 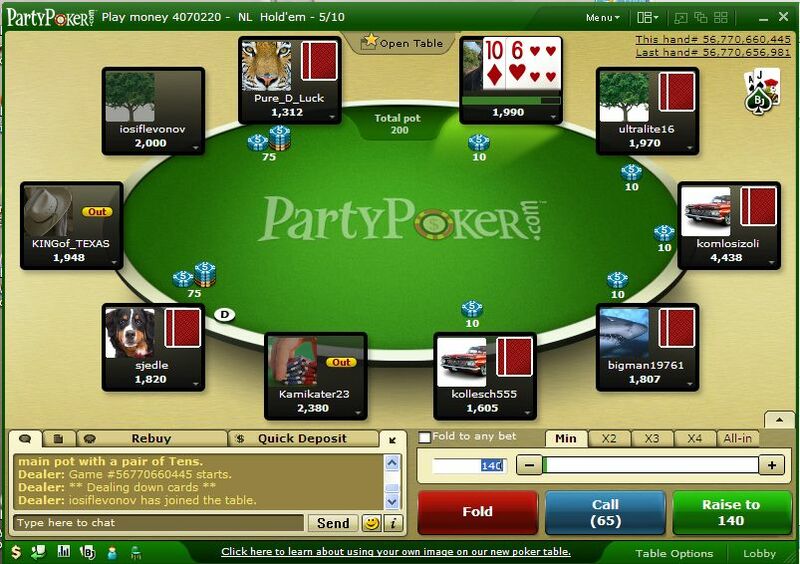 Party Poker offers another excellent feature for new players - Beginner Only Tables. These are special cash game tables, and only players who have made their first deposit within the last sixty days can play at them. You can sit with all the fish for two months and take advantage of the new players. There are plenty of satellites all week long for the Sunday $300,000 Guaranteed - in fact, players can qualify for as little as a $3 investment! Party Poker also offers a wide variety of sit and go tournaments that run around the clock. The majority of sit and go's are No Limit Hold'em, but there are also other variations including Limit Hold'em, Pot Limit Omaha, and Seven Card Stud. Sit and go buy-ins start at $1 and go all the way up to the hundreds. Party Poker also hosts satellite tournaments to live poker events like the World Series of Poker (WSOP), World Poker Tour (WPT), and Aussie Millions. Party Poker rewards its members by way of PartyPoints, doled out for paying tournament fees and participating in raked ring games. These points have versatile uses, including the release of bonus money, buying into freerolls and other special tournaments, and purchasing gear from the Party Poker Store. PartyPoints also relate to a players VIP status: Bronze, Silver, Gold, Palladium, and Palladium Elite. When a player increases their level, they are rewarded with exclusive tournament entries, deposit bonuses, cold hard cash, and other valuable offers. The higher a player's level becomes, the faster they will collect points, making it even easier to climb the Party Poker loyalty ladder. As you can see, players receive bonus money and straight up cash for climbing the ladder. To get started in the Party Poker rewards program, create your player account at www.PartyPoker.com. We've listed all of the deposit and withdrawal options that Party Poker will process. IGMPay, Visa, MasterCard, NETeller, Citadel, Firepay, Wire Transfer, Bank Draft, Cashier's Check, Money Order, ECheck. IGMPay, NETeller, Wire Transfer, Check. Thank you for reading our review of Party. If you liked what you read, make sure to visit PartyPoker.com to get started. Remember that Party Poker offers easy-to-beat Beginner Tables, the PartyPoints Rewards system, and a great tournament lineup. If you sign up, make sure to use bonus code 500PS to redeem your 100% up to $500 sign up bonus along with the $1,500 freeroll satellite tokens.